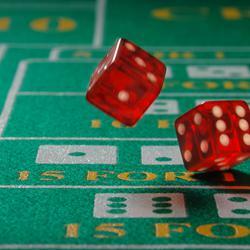 Some might think that a table game like Craps wouldn’t translate well into a virtual format. However, more and more people (and conversely, online casinos) are realizing that Craps, like most other games, works quite well when given to an Internet medium. The lure of Craps comes not only from its high payouts and potential for making a good return with the throw of a dice, but also the culture that comes along with it – who doesn’t feel a twinge of something approaching ‘celebrity’-dom when they toss a dice on the green table and it comes up with a 7? As a staple casino game, it’s no surprise that Craps has become as popular online as in real-life. However, although seemingly simple, there is a degree of complexity and depth to playing Craps that eludes most players. Primarily, a bet is made on what number will be rolled (with 3, 12, and 2 being Craps). If the turn doesn’t end, that number becomes the ‘Point’ which all subsequent bets will work off of. The complexity comes in the types of bets, since there are quite a few depending on the circumstances and the roll. The most common is the Pass Line, and is considered the ‘safest’. It is also the most basic and is considered a ‘series’ bet, in that it can include a number of bets before it resolves. For instance, if the roll of the dice was 6, the next roll to win will have to be point or a 7. If the roll was originally a 7 or 11, it’s an automatic win and the roll resolves on its own. And if it was a 2, 3, or 12 it’s a Craps, and you lose. It may sound complicated, but in fact after a few rounds it’s quite easy to pick up, and most players find themselves experimenting with more complicated betting systems. Working in conjunction with the Pass Line bet is the Odds bet – this can be wagered mid-way in a Pass Line and has to do with the odds of another number being rolled before a 7 shows up, and each number (according to its probability of being rolled) has an accompanying ratio payout. For instance, a 4 has a 2:1 wager, while an 8 has a 6:5 wager. Regardless of your knowledge of all the bets – although it’s prudent to make sure you have an understanding of at least all the basic ones – the difference in playing Craps online is that you’re basically having a computer roll the dice for you, instead of doing it yourself. Unless you’re very skilled with dice, this negates any possible advantage/disadvantage a player might have. The benefit of playing online is also the fact that most online Craps games incorporate as many of these different bets and rules as possible. Since the roll is produced by a Random Number Generator, it also eliminates any ‘foul play’ that one can run across in a real casino. The only downside to online Craps? Not being able to blow on the dice for luck.